Listen to your favourite songs in music player. It supports MP3, WAV, eAAC+, AC3 etc. file types. 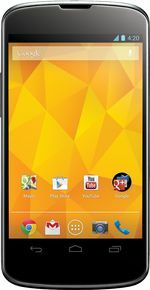 LG's Google Nexus 4 is a powerful unlocked smartphone with a beautiful, minimalist design, fast performance, and the latest version of Android. Updated The Google Nexus 4 is here to take over from the Galaxy Nexus, with impressive specs at an even more impressive price point.